I can’t seem to get out of the kitchen these days. Every night, once the kids are tucked into bed, I tell myself that I will organize a drawer (ya right), just veg out on the couch and watch TV or go to bed early! Instead, I always end up back in the kitchen cooking or baking! Last night’s experiment was muffins. I went a little crazy at Whole Foods last week and bought a few new flours to play with – spelt flour, brown rice flour and chickpea flour. I used the brown rice and chickpea flours to make some cookies that were just OK. Definitely not blog worthy. Last night I opened up the spelt flour and 45 minutes later, I had a delicious muffin in my hands! The muffins were certainly worth writing about! I’m on the fence as to whether or not spelt agrees with my tummy. I definitely prefer it to traditional wheat. Whole grain spelt is high in protein and fibre, and contains more nutrients than traditional wheat. It is a good source of calcium, magnesium, selenium, zinc, iron and manganese. So for now I eat spelt, but not huge amounts of it, and my stomach is not protesting! This recipe is not super sweet – there is just a 1/4 cup of maple syrup. I find that the sweetness of the raisins and carrots are enough. You could substitute the coconut milk for another milk of your choice – I had some left over from another recipe that I needed to use up, so I used it in these muffins. I based this recipe on Marni Wasserman’s Spiced Carrot Ginger Muffins. Preheat oven to 350. In a large bowl, mix together dry ingredients (spelt, baking soda and powder, cinammon). In a separate bowl, mix together remaining ingredients. Slowly add wet ingredients to dry ingredients, mixing as you go. Do not over mix. Stir until just combined. Spoon batter into prepared muffin tins (either greased, or using muffin cups). Bake at 350 for 20-22 minutes. Remove from tins and cool on a rack. ENJOY! These muffins were moist, light, fluffy and I was really impressed by how high they rised in the oven! The kids loved them and so did I! 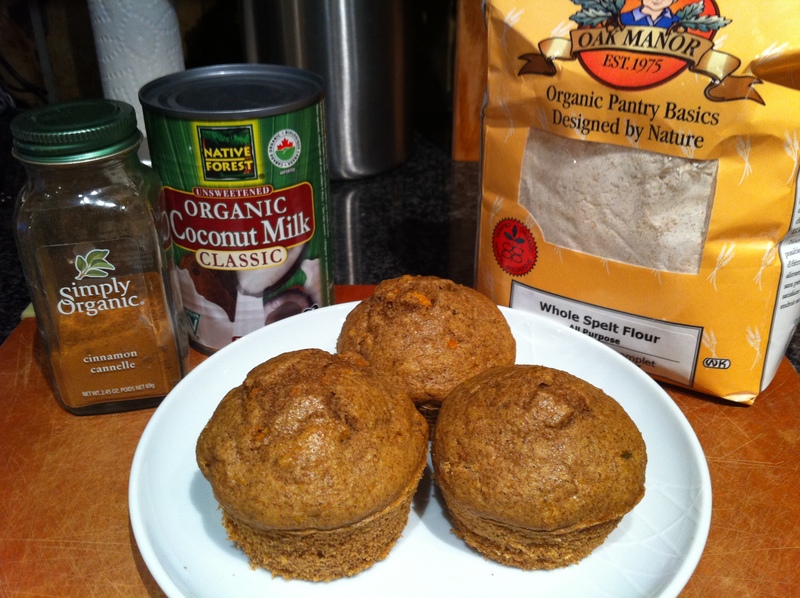 Categories: Baking | Tags: Baking, coconut milk, Muffins, Spelt | Permalink.